The historic town of Badami is famous for its Cave Temples that date back to the 6th and 7th centuries. Located at Badami in Bagalkot district of North Karnataka, Cave Temples represent the architectural style of the ancient times. Badami is located at the orifice of a gorge, fringed by two rocky hills and surrounded by the Agasthya lake. The place is situated at the mouth of a valley, flanked on either side by beautiful sandstone hills. Formerly known as Vatapi, Badami was the capital city of the Badami Chalukyas who ruled from 540 to 757 AD. As per the legend, the two demon siblings Vatapi and Ilvala used to kill all mendicants by trapping them until Sage Agastya counter-tricked them and brought an end to Vatapi's life. Two of the hills in Badami represent the demons Vatapi and Ilvala. The cave temples were carved between 6th and 8th century which features images of Hindu deities such as Ganapati, Mahishasura Mardhini, Vishnu, Trivikrama, Shanmuka, and Ardha Nariswara. Another unique feature of the carvings is the dance poses of Lord Nataraja. 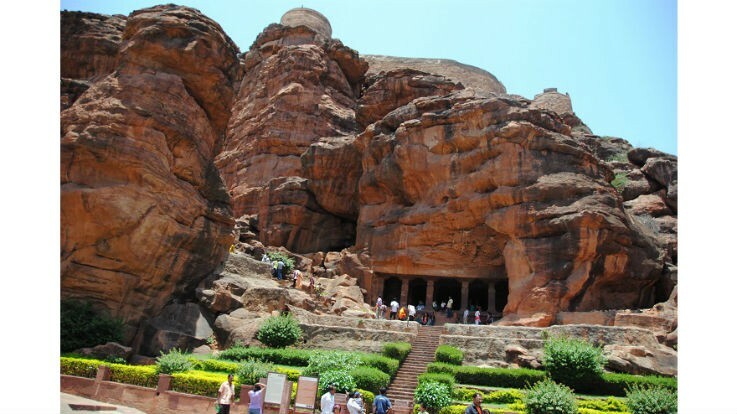 The history of Badami cave temples can be traced back to 600 and 700 CE. The architecture is a mix of North Indian Nagara style and South Indian Dravidian style. Each cave temple has a Garbha Griha, a mandapa, a verandah, and pillars. The cave temples also have exquisite carvings, sculptures, and beautiful murals. Other temples found at Badami are Bhutanatha temple, Malegitti Shivalaya, Dattatreya temple, Mallikarjuna temple, and Banashankari Temple. Apart from the Hindu temples, one can spot Jain temples with the carvings of Jain Tirthankaras Mahavira and Parshwanatha. It also has a Buddhist cave, where, one has to enter by crawling on the knees. Badami was ancient kingdom of Chalukyas. Badami was established in the 6th century by Pulakesin I. The architectural expansion was observed by the Chalukyas. The sect constructed numerous temples and monuments. Carved out of sandstone hills, Badami Cave Temples boast of rock-cut architecture. There are four cave temples in Badami which enclose brilliant carvings with the sculptures of Hindu deities. The first and the foremost cave was built in 578 A.D. Tourists reach the cave by taking a flight of 40 steps. Devoted to Lord Shiva, the cave adorns at least 81 sculptures of Lord Shiva in the form of 'Nataraj' having 18 arms. The cave is carved out of Red sandstone which has a verandah, a hall with columns and a sanctum. The ceilings and pillars are decorated with paintings of amorous couples. The second cave sited at the summit of a sandstone hill is dedicated to Lord Vishnu who is present in the form of a 'Trivikrama' (dwarf). His one foot is commanding the Earth, and with the other, he is mastering the sky. The third Cave Temple was built in 578 A.D. The front elevation of the cave is nearly 70 ft wide. The sculpture of Lord Vishnu in the and a serpent captures the attention. Here, Lord Vishnu is represented in his various incarnations including Narasimha, Varaha, Harihara (Shiva-Vishnu) and Trivikarma. Built in the 7th century, the fourth Cave Temple is dedicated to Lord Mahavira, the 24th Tirthankara of the Jains.  It has an image of Lord Mahavira in a sitting posture. 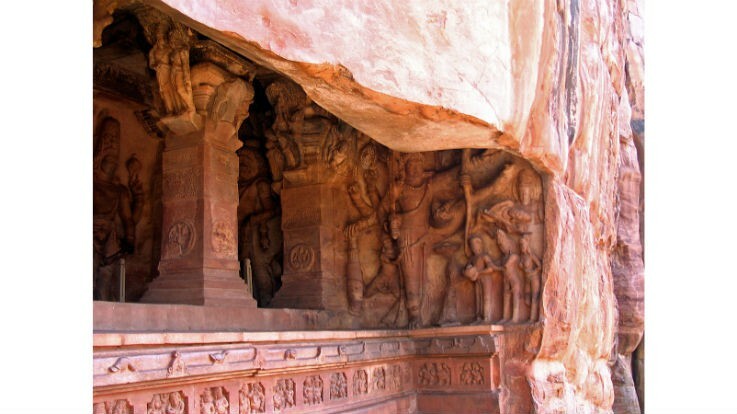 The artistic quality and sculptural grandeur mark the very sight of Badami cave temples. 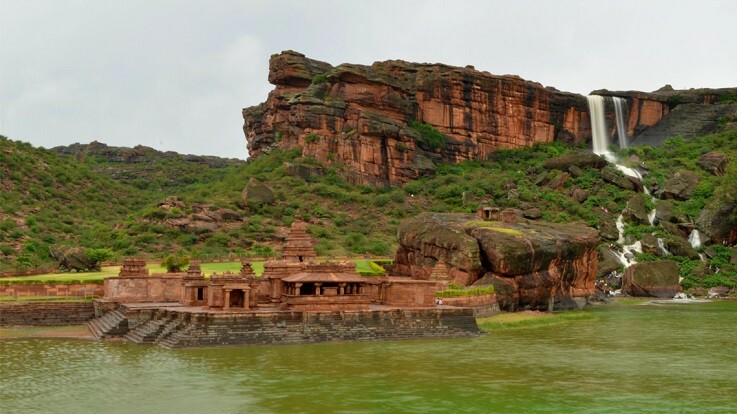 Being an important center of worship, Badami has religious and social significance. A visit during the temple festivals will give you an experience of the town’s modern day relevance. The festival at Banashankari held in the winter months. Other important festivals of Badami include the Mallikarjuna and Virupaksha Temple Festivals. By Train: Badami has a railway station which is 5 km away from the town center. Tourists can also catch the trains from Hubli or Solapur. By Road: Badami is 450 km away from Bangalore, via NH48 and NH50. Regular buses are plying between Badami and major cities like Hospet, Bangalore, Gadag, and Bijapur. By Air: The closest airport to Badami is Hubli Airport, which is 84 km away. Another airport is Sambre Airport in Belgaum which is 123 km away.